It was chucking it down with rain from yesterday afternoon onwards but Labour’s Ben Coleman still secured an 11.5% swing against the Conservative Party in the Town by-election in Fulham. I am grateful to all of those residents that voted for us and to all the volunteers that campaigned for us. Thank you. These results underline how my Labour colleagues and I have a good chance of winning control of the Council in 2014 and putting an end to the awful things the Conservatives are doing. 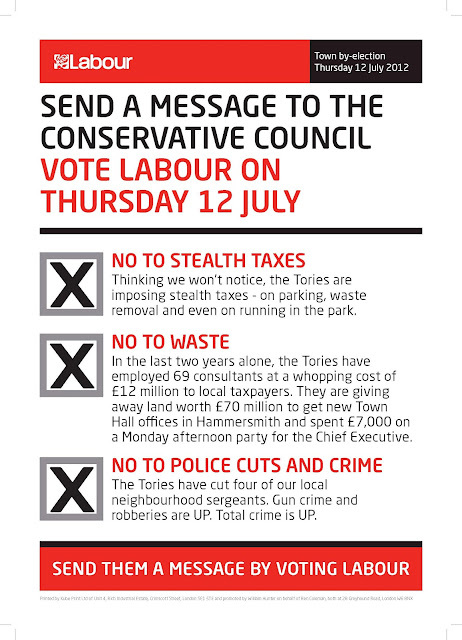 If we do win, we will stop the Conservatives’ wasteful use of taxes payers’ money such as: £70million for new Town Hall offices; £5million on propaganda; £12m on so-called “consultants” and even £1.5m for legal fees they need to fight local residents and businesses objecting to their dubious building schemes. We will redirect all that money into cuts to council taxes, investing in modern, efficient services and we’ll put extra police onto the streets. Full details to follow when we publish our 2014 manifesto.